It's the second period between the Montreal Canadiens and the Toronto Maple Leafs. The Leafs took a quick lead, but the Habs' goalie has kept them in it, stopping oncoming pucks with his back for most of the game while he thoughtfully gazes into his own net. During moments like this at the Lunenburg Tabletop Hockey League's second season opener on September 6, I can't help but imagine a breathless Foster Hewitt calling the surreal play-by-play. 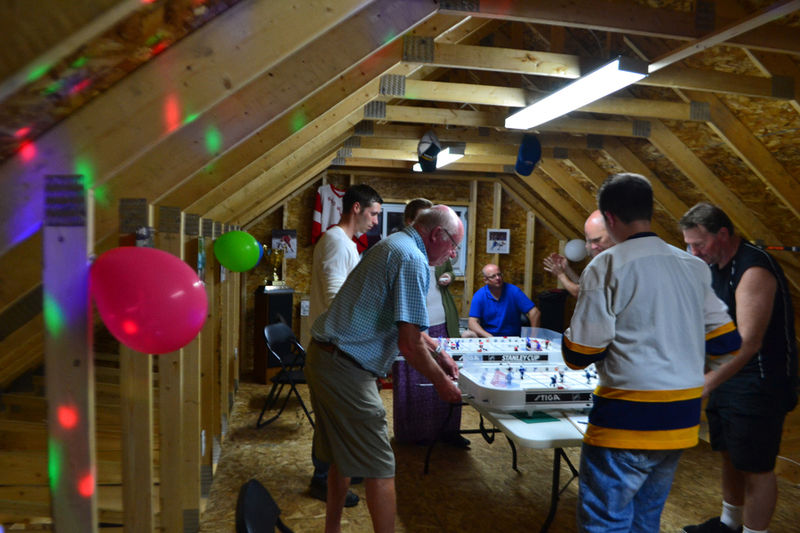 Six competitors have met on the second floor of league founder Cody Nodding's garage for the festivities, on the Northwest Road just outside Lunenburg. Posters of hockey greats hang on the walls, coloured lights spin around the room and a trophy bearing the name of last year's champions sits in the corner. A mix CD with a track-list including "O Canada," "Good Old Hockey Game" and "NHL 99 Menu Music 1" is placed on top of the stereo just in case. The group will meet here every Tuesday to play during the league's 14-week season. After that, the four teams to reach the post-season will play an additional two weeks, with a champion presented with a trophy and a cash prize sometime in January. Nodding now has a group of about nine regulars, and he's hoping more will join. But back when he was starting out, convincing people to give the game a try wasn't an easy sell. "Some people were kind of skeptical of the idea ... some people just said I'll go try it out, see how it goes," he said. "When we started playing the first night, when we dropped the pucks everyone was really shocked by how fast the game was. We had a lot of fun and it just caught on." 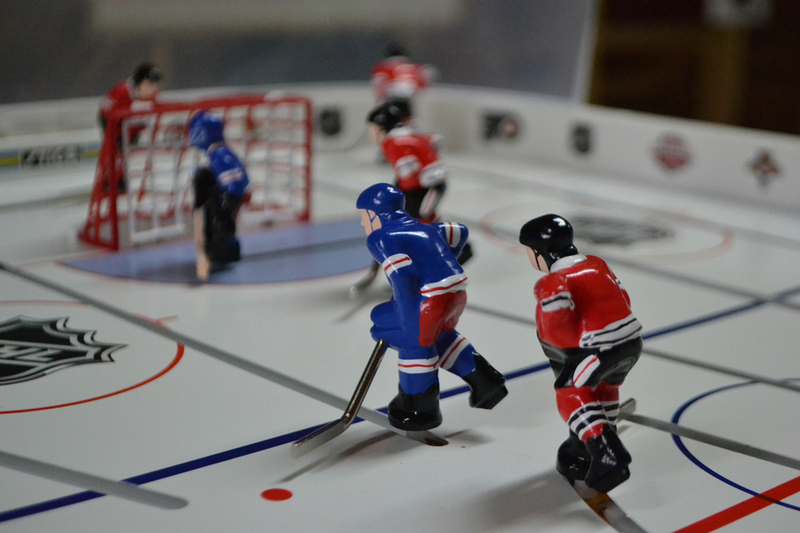 Tabletop hockey recreates Canada's favourite game on a miniature scale. The large ice surface is replaced with a few feet of plastic, and a team's movement is controlled via twistable metal rods by the all-seeing player looking down from above. The game dates back to the 1930s, when it was created in Toronto by Donald H. Munro as a Christmas gift to his kids. Years ago, Nodding came across a table nearly that old at a flea market - one dating back to the 1950s, made by Eagle Toys and sporting tin players. The impetus to start the league was to dust off that antique table that he bought but never used. "I was cleaning out the back room in the house one day and I saw this sticking out from under the bed," said Nodding. "I thought, you know, I bought that but I didn't use it, so why not make use of it." Nodding had already tried to start a league when he was in junior high. But with a group of kids, not entirely in control of their own schedules, he couldn't get it off the ground. "We only did it for a week, and it didn't fly because of just trying to get to everybody's houses every weekend. It was hard for the parents and it just fizzled out," said Nodding. "This is kind of like a redemption thing for me to bring it back and get it going." But once things got rolling, the antique table didn't cut it. Now the league uses Swedish-made Stiga tables, which Nodding says are the only models licensed by the NHL. And with pro-grade tables comes the addition of a few rules. Some to keep the game moving, others to cut back Nodding's time spent replacing the tables' parts. Participants who aren't playing stand-in as referees for other games, mark goals on a clipboard with a stopwatch in hand and keep an eye out for illegal plays. A player is called for "jamming" when he or she slams the tiny figure into the end of its movement slot. Two-handing is when a player uses both hands to forcefully spin the rod. "There is to be zero tolerance on two-handing," said Nodding during the opening ceremony, before breaking with a laugh. "This action can result in immediate suspension from the league. And you laugh, I will do it." Each player represents the NHL team of their choice. Shane Weaver plays as the Toronto Maple Leafs. Last year, he finished "fourth in the league, first in their hearts." "I've known Cody since about Grade 5, and whenever he comes up with an idea I just follow it, because I know it's going to be great," said Weaver. "So he pitched this to me, and I supported him of course, and it turned out to be a lot of fun." Like most in the league, Weaver has memories of playing tabletop hockey as a child. He used to play to pass the time with his uncle, but he never really considered its application to adult life. For him, the hockey is fun, but the evening is really a way to catch up with friends and blow off steam. "I love getting out of the house. You know, I work a labour job, so it's nice to get out and see people, and new people drop by every week," said Weaver. "There are friends here, guys I've known a long time." But for Roger Heisler, it's all about the competition. Heisler, who's new to the league this year, is a die-hard Montreal Canadiens fan, and now he represents his favourite team in the league. "It's fun, it's a night out and it's competitive," said Heisler. "I'm a pretty competitive person, although I lost pretty bad that first game tonight." Now, with the league up and running, Nodding still thinks there's room to grow. 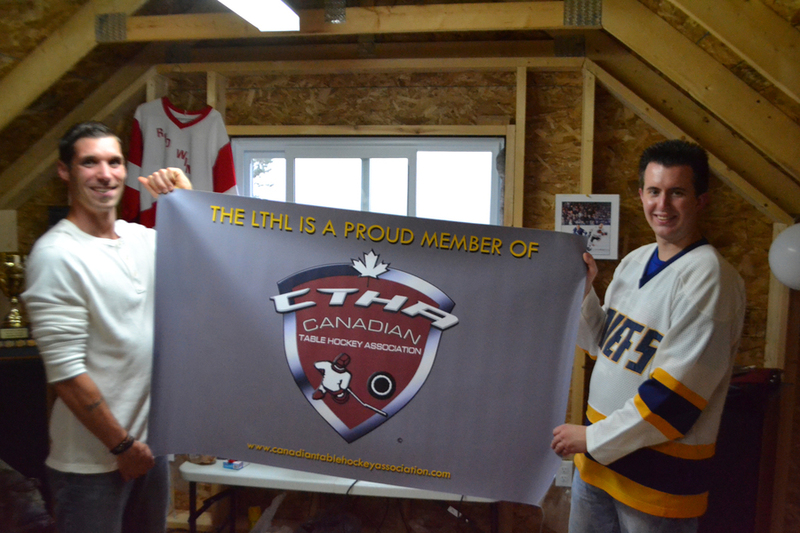 In August, he got in contact with people from the Canadian Table Hockey Association, a group of 17 leagues across the country, which Nodding's league has just joined as the first member in Atlantic Canada. 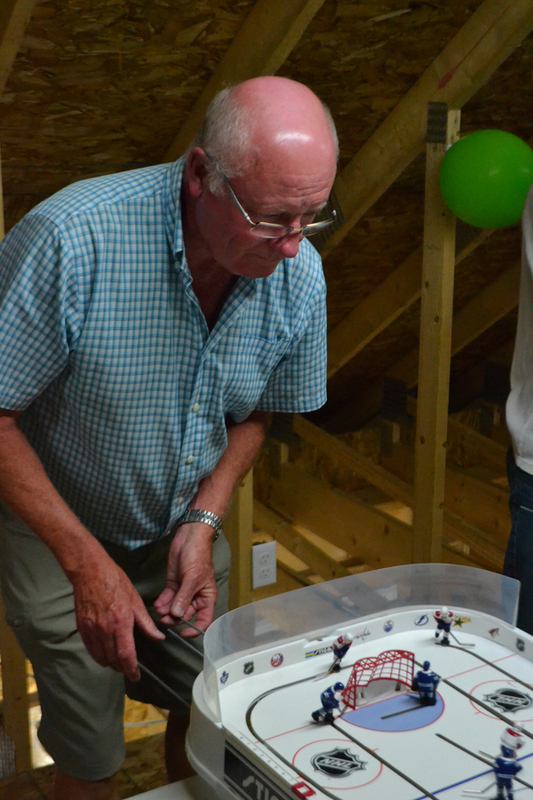 For Nodding, it's a way to reach out to like-minded people, grow the community and make sure his garage is home to miniature hockey moments for years to come. "I want this to become a tradition; that's why I've got the trophy here," he said. "We'll just keep trying, keep getting new people, keep putting the word out. That's my goal. 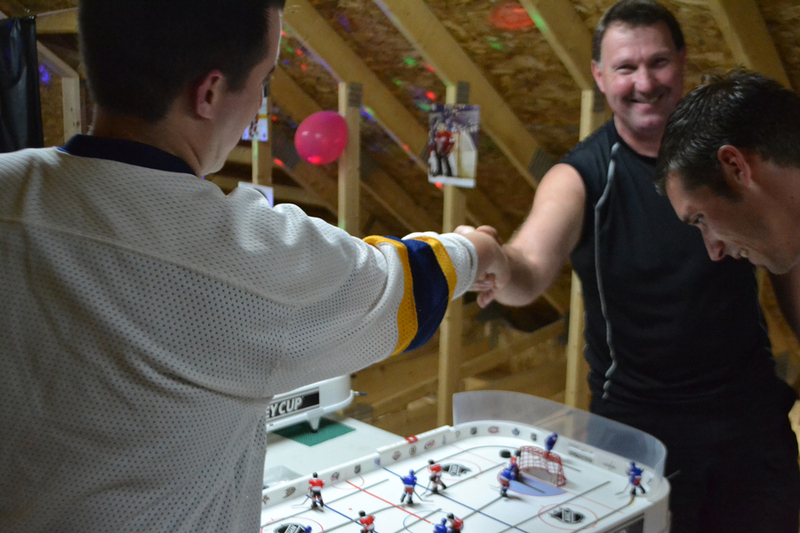 Get it bigger, keep it going and promote the game of table hockey."